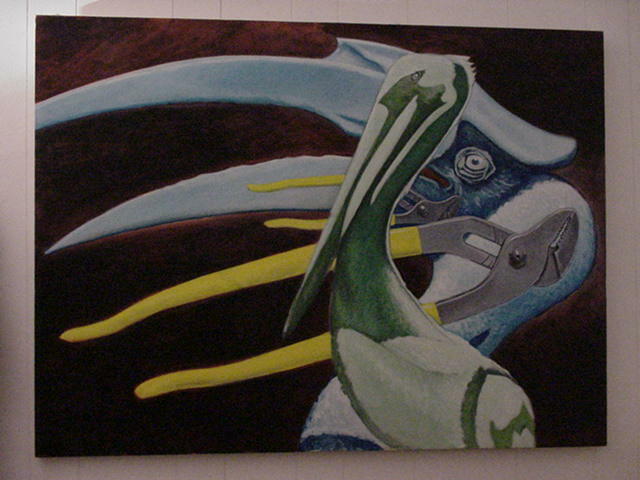 All artwork and photos on these pages is copywrited by Jim Franklin, JFKLN. all rights applicable, may not be reproduced without written permission from the artist. 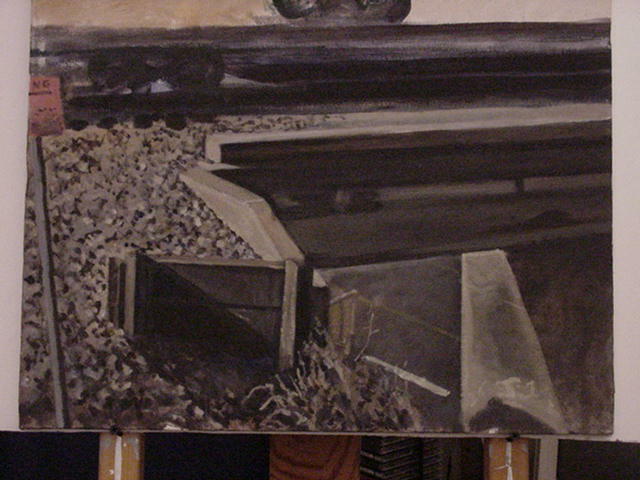 "The Meek Shall Inherit the Highway", oil on canvas, 1997. 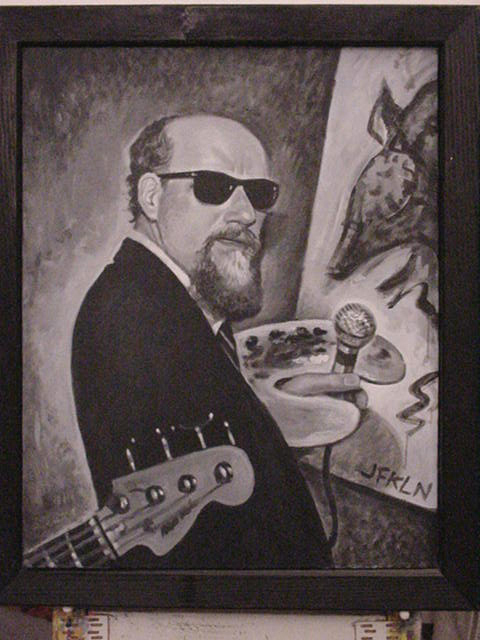 This one was used for the cover of one of Gary P. Nunn's CDs. Willie hauling his crop of guitars off to market. 4th of July PicNic painting. Acrylic, 4'x4'. 1998. This abstract painting I made during a performance with The Insinuators at Saxon Pub, Austin, Texas. 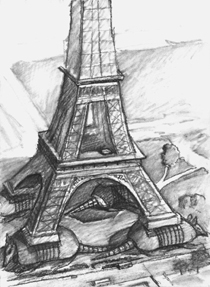 This drawing I made in Paris in 1998 after a visit to the tower. I could have sworn I saw these giant armadillos holding the whole thing up. I may have to go back just to make sure. The one below of the Depot (now destroyed) in LaMarque, Texas, my hometown. I painted it in 1959 at the age of 16. 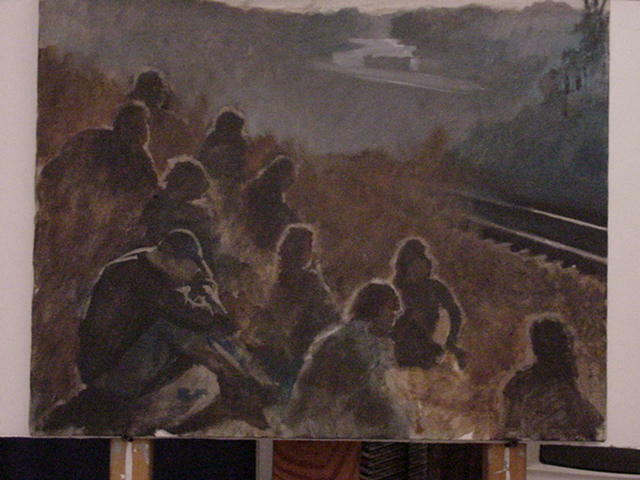 After painting the rail bridge above, I turned to my left and painted the homeless people who were sitting along the embankment. 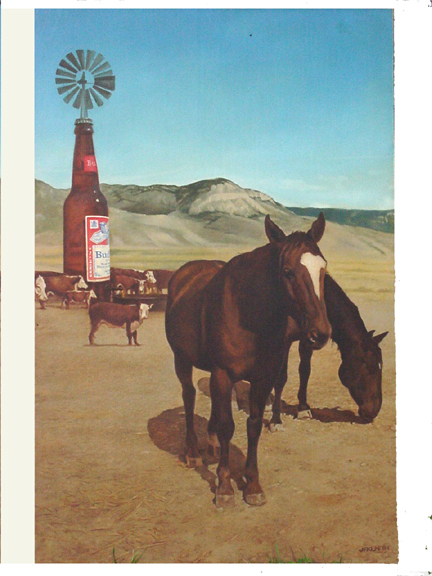 I bought them a case of beer and found them to be friendly, they did not object to being the subject of the painting. These are the hunter gatherers produced by the industrial history which has progressed since the first hunter gatherers became farmers. A long cycle repeats itself. churchoftheeverydayman.com Check out this site and look for my alter holy ego,The Rev. Monty Riff plus the Infamous MinceMeat Mercer of Ramon, Ramon and the 4 Daddy-Os, Rev. Kyle Hatch and his son, Rev. Ramadan Hatch. This site is not for the religously narrowminded or the ultrapious or those who can't take a little laughter with their daily prayers. threadgills.com is Eddie Wilson's site devoted to the restaurant, Threadgill's as well as a vast collection of Austin Music Culture, being the original manager and co-founder of Armadillo World Headquarters.